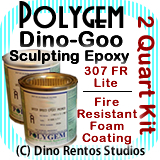 Polygem Dino-Goo 307FR Epoxy Clay Foam Coating - 2 Quart - Dino Rentos Studios, INC.
307-FR-Lite is a 100% solids fire-retardant epoxy system specially formulated to a trowelable paste consistency for sculpturing and fabricating projects. It will cure into an extremely strong and light-weight plastic that is easily sanded or shaped. 307-FR-Lite can be tinted or painted and accepts stains. It bonds well to most surfaces including fiberglass, foams, metal, wood and concrete. It is solvent-free so it won’t melt or dissolve foam surfaces. 307-FR-Lite can be used as a sculpturing or texturing veneer over other surfaces and is thick enough for immediate embossing upon placement. It is ideal for indoor or outdoor exhibit projects where strength and durability are desired. It can also be used as a patching compound to repair broken or damaged exhibits. Use Thickener to change FR-Lite from a paste to a clay. Thoroughly mix equal amounts of Part A and Part B by volume until streak free. Wearing protective gloves, trowel or spread the 307-FR-Lite and immediately texture, emboss or finish as desired. Small amounts of water may be used to help prevent the 307-FR-Lite from sticking to the gloves. Weight per Gallon 8.25 lbs.